The new MUV Electric Wheelbarrow, or mini-dumper, from Nu-Star Material Handling not only allows operators to transport heavy loads with ease, it eliminates the unnecessary ergonomic challenges and production halts associated with traditional wheelbarrow solutions. Furthermore, the savings made in reduced labour and enhanced efficiency ensure rapid return on investment in sectors that include construction, industrial, agriculture, horticulture, landscaping and gardening. 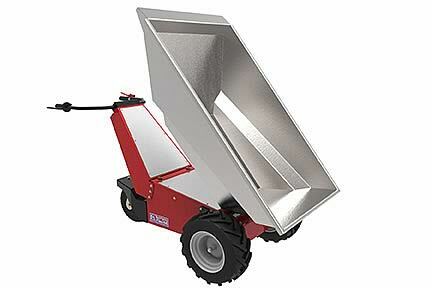 The MUV Electric Wheelbarrow from Nu-Star Material Handling Ltd, shown with galvanized steel tub in the tipped position. Demanding industries such as construction call for increased profitability and efficiency, while at the same time protecting workers from over-exertion. The MUV Electric Wheelbarrow eliminates the pushing and pulling required when using a conventional manual wheelbarrow and, since it has a push-button operated electric dump (capable of tipping loads up to 350kg), it also removes the lifting effort required when emptying/dumping a wheelbarrow. With a choice of either 800W or 1,200W DC electric drive motors, the MUV Electric Wheelbarrow is virtually noise free in its operation, making it ideal for internal use and in areas where noise-pollution is a concern for local residents. Since there are no handle-bar vibrations to cause Hand-Arm Vibration Syndrome (HAVS) or ‘dead finger’ the Electric Wheelbarrow may be used without having to assess this potential risk to the operator. The MUV Electric Wheelbarrow is available with both moulded industrial plastic and galvanized steel tubs, which may be interchanged by removing locking detent pins on the sub-frame. Other attachments, such as a flat-bed for transporting bricks, tiles and blocks are also available. Power comes from two 12V, 90AHr batteries, each is sealed-for-life and maintenance free. The waterproof battery charger is fitted on-board and may be connected to either a 220V or 110V power supply. The batteries and battery charger are matched to enable opportunity charging, at any point in the charging cycle, thereby considerably extending run-time. A coloured, LED battery-charge indicator gauge on the control panel clearly shows the battery state. Featuring a highly manoeuvrable design, the MUV Electric Wheelbarrow is operated using an infinitely variable, twist-grip throttle on the right handle in conjunction with a forwards/backwards direction switch on the control panel. Maximum speed is up to 4.6km/h for the 800W version and up to 6km/h for 1,200W version. An additional ‘tortoise’ mode switch on the control panel reduces maximum speed by 50% to enable inch-perfect positioning when activating the electric-tip and to help achieve a graduated release of the wheelbarrow contents. The front drive wheels and rear swivelling castor are fitted with industrial foam-filled tyres, making them puncture-proof and impervious to the nails/screws and sharp objects often found on littering construction sites. In addition to regenerative braking provided by the 125Amp motor controller, there is a 6Nm electromagnetic brake for holding the wheelbarrow when on slopes and when in transit between locations.